We’re pretty soft on our dog, Sparky. While a lot of neighborhood dogs are still outside (we can hear them barking) in cold weather, we tend to bring him inside when the temps get below 40 degrees. Sometimes when he’s outside, though, he’ll come sit right in front of the sliding glass door that leads to our backyard. He’ll just sit there, looking inside toward us. Like in this photo to the right. It’s simultaneously the saddest, funniest and most pathetic thing you’ve ever seen. Sometimes, the shivering is justified. It might be 40 degrees, but if the wind is kicking up (as it often does here), it feels a lot colder. Or it might be that we didn’t notice the drop in temperature in the late afternoon, and he’s really getting cold. But other times, there’s no reason at all for him to be shivering. Sunny, 45-50 degrees, and he just sits there shivering because he wants to come in. That was the case yesterday morning. It wasn’t all that cold, and he was outside. I noticed him shivering and decided to do a little experiment. I tested him. I walked into the family room where he could see me, and he was shivering like he wanted to come in. Then I walked out of the family room, out of sight — he couldn’t see me at all. But, I peeked around the wall and could see him plain as day. As soon as I left his sight, he stopped shivering! He just sat there, looking around, looking at the birds in the trees, etc. I spied on him for 30 seconds – nothing. No shivering at all. Then I walked back into the family room where he could see me, and as soon as he did … he started shivering again. 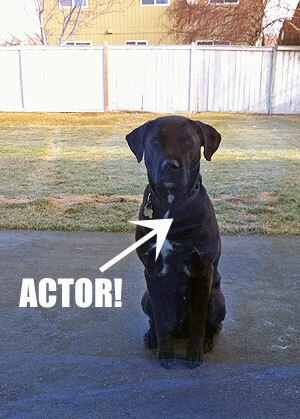 My dog is a total actor!!! It didn’t work. But I have to confess … I admire his acting skills and the fact that he’s smart enough to try acting his way back inside. Well played, Sparky. Well played. Last Tour Inside the New House?